A COWBOY’S TOOL OF HIS TRADE……….. Sometimes in parts of New Mexico, Nevada, Arizona, Texas and perhaps other states where large ranching operations are present, the working cowboys often store their saddles during off seasons in various facilities to keep them safe and in climate-controlled buildings. 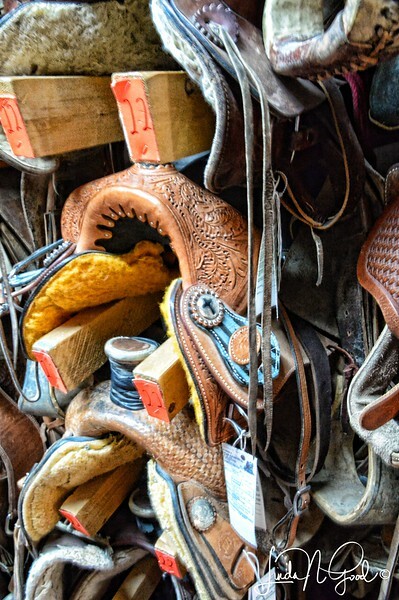 I took this photo of just a small portion of the saddles that were stored in a Trading Post in Gallup, New Mexico. I wondered with my camera into a back room that was filled to the ceiling with saddles and tack. I probably wasn’t supposed to be back there, but the door was open and how could I resist not going in with my camera? The saddles were all stored on racks and tagged with a number, and many of them had the saddle blankets and various tack stored with them. I asked the owner if they had been pawned, and he said “No, in that room is where we keep all of the equipment that the cowboys and ranchers ask us to store for them for safekeeping. The room will empty out in March and April of next year. It was quite a sight to see. Many were of very elaborately tooled leather with silver adornments…..just lovely. Sit tall in your saddle today! Terrific shot...glad you wandered back there! Excellent shot and find! Never miss a photo op! Lots of artistry in some of those saddles! Wow, what a find; good catch! Very nice. Love walking into stores like this. Great choice to focus on just a few rather than the whole roomful. It adds impact, I think. It must have been an amazing sight.